Malian-born environmental engineer Hadi Touré had only been a member of African Sky for a few months when she began to formulate the idea for a project designed to educate youth in Mali about science, technology, engineering and mathematics (STEM). As the Health Program Director for African Sky, she decided to facilitate a science day geared toward educating and encouraging high school students to be proactive about environmental awareness. Inspired by two organizations working in Mali, STEMusso and O2 Environment, Hadi thought it best to pursue a collaborative effort. STEMusso works to empower young women in Mali who are interested in pursuing a profession in science. O2 Environment aims to improve the environment quality of Mali by working with local citizens. African Sky previously cultivated a partnership with Bambougou N’dji high school in Markala, where Hadi organized the science day for grades 9-11. “We had PowerPoint slides and talked about what STEMusso and the STEM field was,” Hadi said. 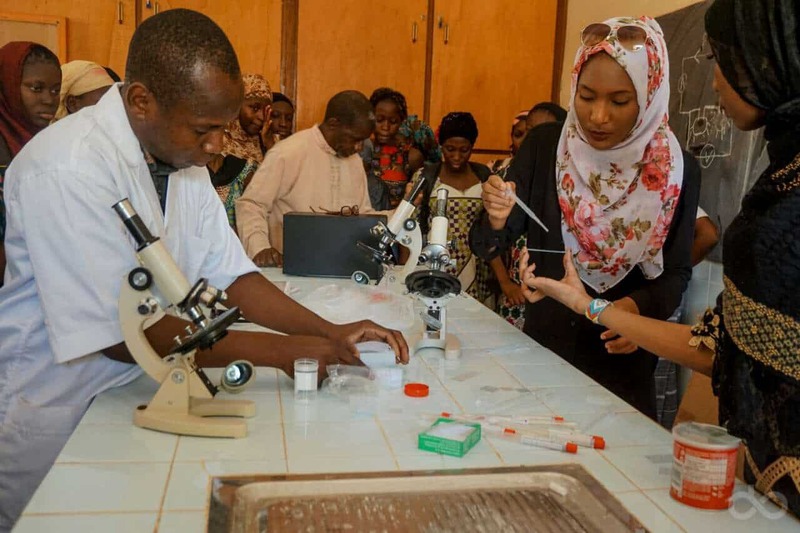 “We showed profiles of women in sciences and talked to them about how it was possible for them to pursue, too.” In Mali, after the 11th grade, students decide whether they want to pursue sciences or literature. Most girls end up going into literature. But Hadi designed the project to encourage young girls to pursue the science path. After the presentation finished, the boys headed outside and started the recycling activity. The girls followed Hadi into the lab where they started observing water under microscopes. First, they looked at water droplets from the tap and illustrated what they saw on the board. They compared those visuals to seeing tap water mixed with the bacteria on their hands, which taught them the importance of handwashing, a concept frequently overlooked in Mali. Science day was such a success that Hadi predicts there will be more in the future with continued support from STEMusso and O2 Environment. After this first endeavor, Hadi plans to spend more time supporting and encouraging young girls in Mali to pursue their dreams in the sciences. During the 11th anniversary of African Sky’s Silent Auction in Akron, Ohio—an occasion where the leadership team, board members, volunteers, and the global community come together to celebrate the partnerships between Mali and the United States—African Sky awarded Hadi with project of the year acknowledging her outstanding effort to raise awareness and empower the people of Mali. African Sky focuses on education projects, women’s literacy, health initiatives, food security and community arts.